Lighting-Gallery-net - Fixtures/Troffers in basement office. 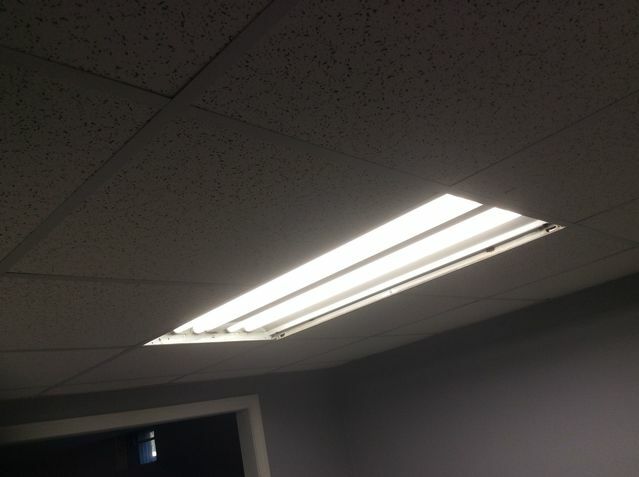 I took out the shop light that was in here soon after I moved in and put this troffer up that I picked up for free to get more light in the office. I just picked up a new shade for it too. Nice! Looks awesome! If you wanted bi-level light you could add a second switch so the inner and outer tubes are separately switched. I've seen it done most often with three lamp troffers (so tri-level lighting!) but I've seen it done with four lamp fixtures and even continuous rows of strip lights with every-other strip on the same switch. Benny's (local hardware store that shut down earlier this year) was famous for that. They would only use half the lights at a time and shut the ones off in front of the store where the windows were to save energy. When the half of the lights that were used burned out, they would switch to the other half lol. I also like the every other light on look. My first job was at a supermarket with three bulb turrets. This one: https://www.lighting-gallery.net/gallery/displayimage.php?album=1588&pos=40&pid=44142. In one row all the center bulbs were on the same circuit, so every other light had two ballasts, and then the outer bulbs were switched with every other light on the same switch. I loved these lights. I usually worked the closing shift, so it was a great privilege to be able to switch all the breakers off at the end of the day. They still used push button breakers for a lot of the lights. I also loved being in the store and watching them being shut off. Different people did it different ways. A lot of times all the outer bulbs were turned off, with just the centers on while we cleaned up. I used to ride by the Rt. 44 Benny's, but never had the chance to go in as I was always with relatives. The half piper I built I used a three way switch, so I could inner two bulbs, outer two, or all 4. These cellar lights all plug in too, and the plug is right in the way of where a 2 X 4 troffer would go if I used the openings that are there for some of them. I did think about double switching this light, but it would require another switch as it is controlled by a wall switch. I thought about doing different color bulbs inner and outer., or maybe even a couple black light bulbs to see how that would look. I don't have any of those yet. You can easily remove the plugs though, just remove the whole box altogether and connect the wires directly to a troffer using the knock-outs on the little plate that slides out on top of the troffer. You'll need one of those connectors with the two set screws (or a pop-in plastic connector) that fits the 7/8" knockout though. You can fit two wires in one connector though, so you should only need one connector per fixture unless there's three romexes going into a plug box. I find it really weird the guy had cord whips put on all the lights. In my opinion that only makes sense for lights suspended on chain, that way the entire light can easily be removed for servicing/cleaning. That's if the wires are long enough. Either the romex or the cord whip may be too short to permit that. So while not a safety issue in my opinion, having a plug in light is illegal if the cord is concealed by the drop ceiling. So if you're going to go through the effort of moving the plug, you're better off just omitting it altogether. That is good to know about the plug and cord above the recessed ceiling. This house was owned by a home builder himself, so I don’t know what he planned on doing down there with the lights. I’m not sure when I will get to change them, I have a lot of other stuff to do right now, and may do these little by little and see what I like and what fits. The opening at the bottom of the stars has a pipe right in the way, which may have been his issue too. A 1 X 4 light would fit there, and I saw one of those at the Habitat Restore but did not really look at it.